Here is a Basic dress with a button-down back from Cheri Williams. Short puffy-cuffed sleeves or long cuffed sleeve. Peter Pan collar. The Pinafore and bib versions have your choice of square yoke neckline, smocked or unsmocked, keyhole back if desired, or 3 buttons. Tied at the side. 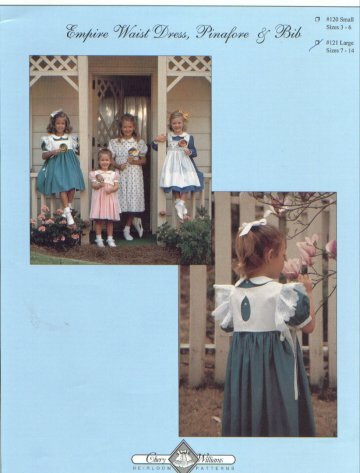 Choose from Girls sizes 3-6 or 7-14 in one pattern.